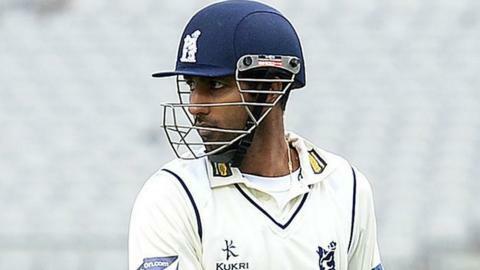 Warwickshire will be captained by Varun Chopra for the home County Championship match with Middlesex, which starts at Edgbaston on Sunday. In the continued absence of injured skipper Jim Troughton, England batsman Ian Bell was available to lead the team for the first three games. But he and Bears all-rounder Chris Woakes have been selected for Friday's one-day international against Scotland. And Chopra, captain for the second half of last season, takes over again. William Porterfield, who is also away on international duty with Ireland, is also missing, which will mean at least three changes from the Bears team that beat Nottinghamshire on Wednesday - to claim their first victory of the summer. Boyd Rankin, Warwickshire's most recent new Test player, is in line to replace Woakes, while another paceman, Richard Jones, the Bears' end-of-season signing from Worcestershire, is also in the frame to make his Championship debut for the county. Former Bears skipper Ian Westwood is likely to come in for Porterfield as replacement opener for the visit of Middlesex, who are second in the Division One table after winning two of their first three matches. And, with Jonathan Trott still taking a break from cricket and Rikki Clarke out injured, the spare batting place vacated by Bell will go to Sam Hain or Leeds/Bradford MCCU's Jonathon Webb, both of whom are in line to make their Bears first-class debut. Middlesex also lose a player to England duty, Eoin Morgan, while Tim Murtagh drops out of the team that beat Yorkshire by seven wickets on Wednesday. Warwickshire (from): V Chopra (capt), I J Westwood, L J Evans, A Javid, T R Ambrose, K H D Barker, J S Patel, C J C Wright, O J Hannon-Dalby, S R Hain, R A Jones, W B Rankin, J P Webb. Middlesex (from): C Rogers (capt), S D Robson, D J Malan, N J Dexter, J L Denly, J A Simpson. O P Rayner, J A R Harris, S T Finn, T S Roland-Jones, R Higgins, H Podmore, A Rossington.